I went to a Steampunk Fair this weekend. According to Wikipedia, "steampunk is a sub-genre of science fiction that typically features steam-powered machinery, especially in a setting inspired by industrialized Western civilization during the 19th century." Picture people dressed in turn-of-the-century clothing, gizmos made of clockwork-type gears, and general whimsy. If you're still confused, check out these photos of the fair, or Google "steampunk" and check out the Images. It was the first year for this particular fair, although there are plenty of others to be found. Therefore, it was a modest affair, with a dozen or so vendors, and some scheduled entertainments, such as Victorian-era belly-dancing (don't ask me, I have no idea), and the very-exciting making of SPONGE TOFFEE from scratch. (Scratch = sugar, water, corn syrup, and baking soda. All the magic is in the baking soda.) Yes, I did get to try the sponge toffee, but from an earlier batch that had been cooling for 2 hours. SAFETY and COMMON SENSE, I haz dem. I didn't take a lot of photos, because, I don't know. I didn't feel like it. Sometimes I'm just not in the mood for photos. I was into experiencing the fair without the filter of my phone. Anyway, cell phones are totally not steampunk. I did take a few shots inside the Historic Zion Schoolhouse, on whose grounds the fair was being held. The schoolhouse was built in 1869, and has been restored to its approximate appearance in 1910. 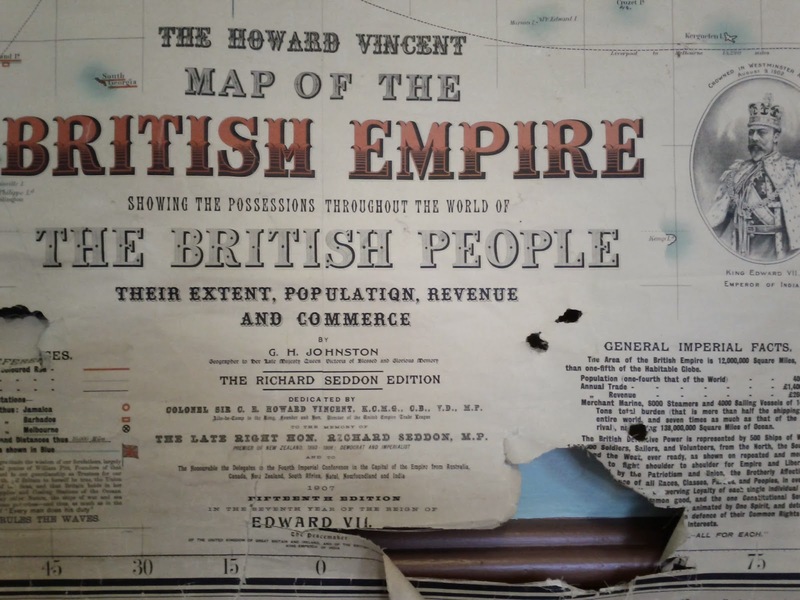 There were some original posters on the walls, such as this map that has seen better days. 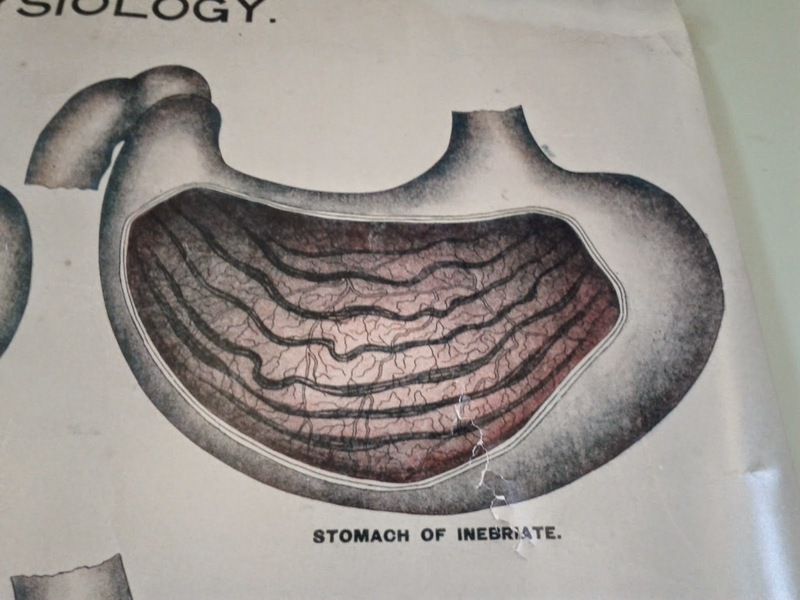 And here, the stomach of an inebriate. You can see that it is dark and full of wiggles, showing the evil nature of alcohol. 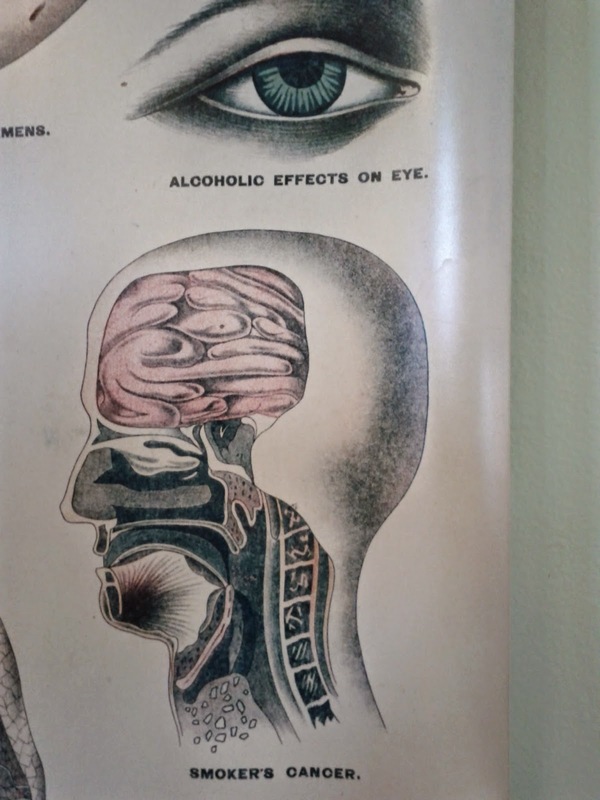 Alcohol will also give you a creepy, drooping gaze. Smoking may give you cancer, which looks like little bits of paper. 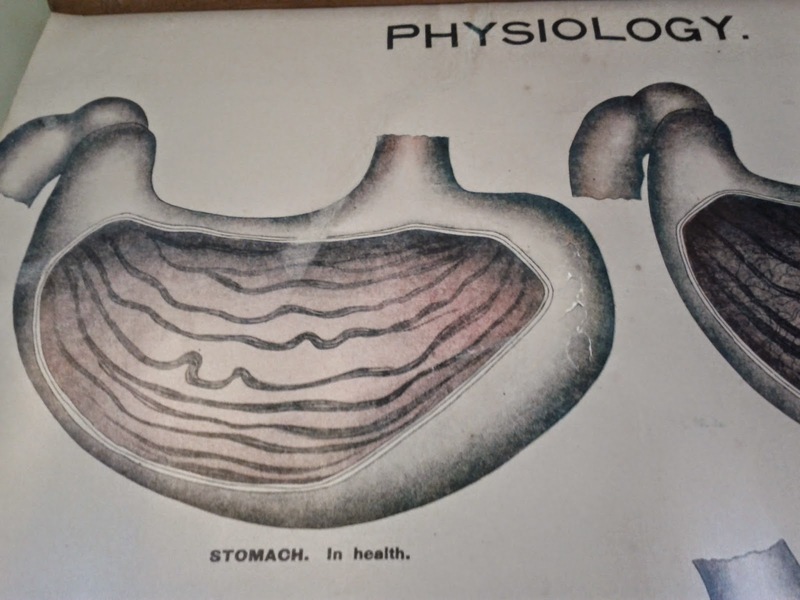 The anatomy is a bit off, especially those square vertebrae with hieroglyphs on them, but it is surprisingly wise for people of that era to be aware of the dangers of tobacco. 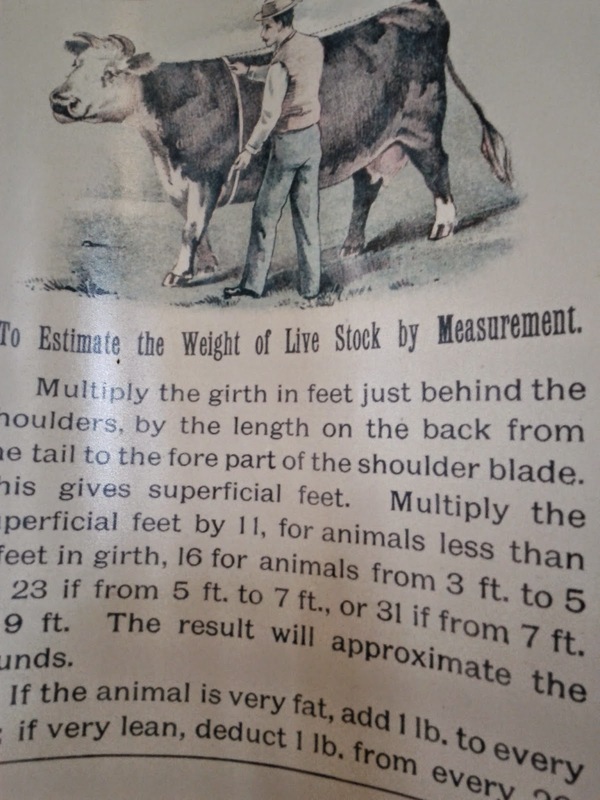 A photogenic cow, having its weight estimated. 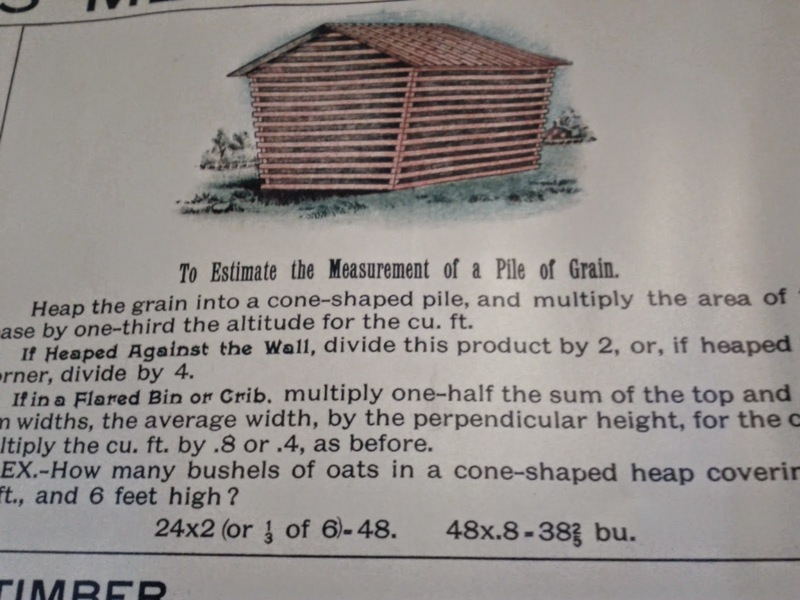 When estimating the volume of a pile of grain, one must use a different equation depending on whether the grain is in a cone-shaped pile, heaped against a wall, or stored in a flared crib. Good to know. I didn't wear a costume to the fair, because I don't have one. I had no idea that just about everyone there would be in full gear, from hats, to boots, to a teacup and saucer in a custom-crafted leather holster. (A proper steampunk character must always be prepared for a cuppa, apparently.) Maybe next time? I've noticed more and more "Steampunk" pins on pinterest, and wondered what it was all about, now I know, thanks. It's a shame you didn't wear a costume, I can imagine you dressed up in turn-of-the-century clothing. How fun! Steampunk is a lot of fun visually, too. Lots of fun movies but I couldn't get into reading it, try as I may. Sounds awesome and Little B would totally go spastic over a steampunk fair. Heck she wears stuff now that would probably qualify as a costume. Also I've seen keyboards for the computer made to look like old time typewriters. It's a cool genre. I guess these are in contrast to Medieval Fairs. I have a grandson who participates in those. I guess they are great to watch but what a pain it must be to participate. Joey: It would be fun to put together one of those outfits, although it would be quite an investment. I wonder where I could find a horsehair bustle. DarcKnyt: I have only read one book that probably qualifies as steampunk. It was set at sea, in a floating city made entirely of old-timey boats. It was pretty neat. Ron: I do like the aesthetic of it. A typewriter-style keyboard would be fun. Granny Annie: The weather on Saturday was very forgiving, but on an ordinary summer day it would be much too hot to get dressed up in one of those outfits. I don't think I really got Steam Punk until I watched Howl's Moving castle. This sounds like fun. I would go to a Steampunk Fair near my if there was one.